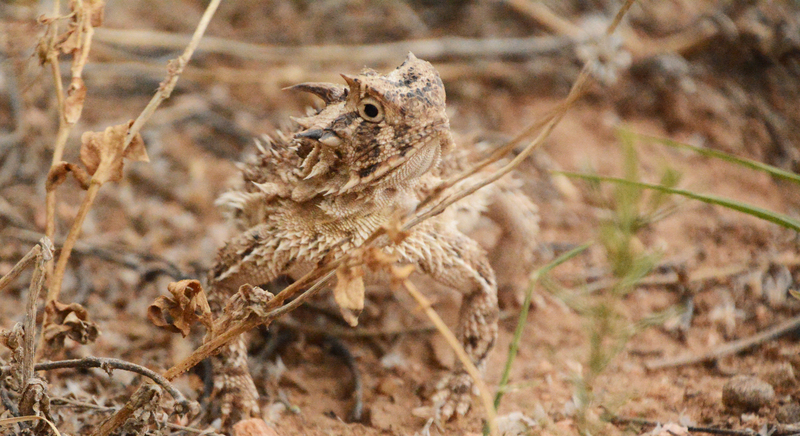 Horned lizards (Phrynosoma) are affectionately called “horny toads” or “horned frogs,” though they are not amphibians.The common names come from the lizard’s flattened, rounded body and blunt snout, making them look like scaly batrachians. Horned lizards employ a variety of means to avoid predation.Their coloration and markings generally serve as camouflage.When threatened, their first means of defense is to remain motionless.But if approached too closely, horned lizards generally run in short bursts and abruptly stop to confuse a predator’s visual acuity.Horned lizards also make themselves look larger and more menacing by puffing up their bodies.A few species have the ability to aim and squirt a fine stream of blood from the corners of their eyes.This behavior is accomplished by increasing arterial blood flow to the head, but restricting venous blood flow out.This physiological mechanism increases blood pressure to the point of rupturing capillaries around the eyelids.A considerable amount of blood may be lost by the horned lizard, but it quickly recovers without apparent ill effects.This defense confuses predators, but also the blood has an apparent foul taste to canine and feline predators, but is without effect against predatory birds. The Texas horned lizard (Phrynosoma cornutum) is the largest-bodied and most widely distributed of the roughly 14 species of horned lizards in the western United States and Mexico.About 70% of the Texas horned lizard’s diet is made up of harvester ants (Pogonomyrmex), but they supplement their diet with termites, beetles, and grasshoppers. In recent years, the Texas horned lizard has declined by about 30% of its range, though it may be making a comeback in some areas.This decline is usually attributed to a combination of habitat loss, overuse of pesticides, and the spread of the non-native, highly aggressive and territorial red imported fire ant (Solenopsis invicta).These are also factors in the eradication of harvester ant colonies, thus destroying the lizard’s principal food source.The Texas horned lizard is now legally protected, and it is illegal to take, possess, transport, or sell one without a special exemption permit.